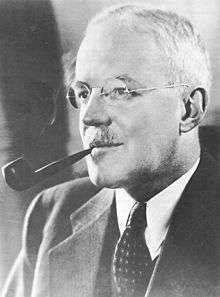 Allen Welsh Dulles (/ˈdʌləs/; April 7, 1893 – January 29, 1969) was an American diplomat and lawyer who became the first civilian Director of Central Intelligence and its longest-serving director to date. As head of the Central Intelligence Agency during the early Cold War, he oversaw the 1954 Guatemalan coup d'état, Operation Ajax (the overthrow of Iran's elected government), the Lockheed U-2 aircraft program and the Bay of Pigs Invasion. Following the assassination of John F. Kennedy, Dulles was one of the members of the Warren Commission. Between his stints of government service, Dulles was a corporate lawyer and partner at Sullivan & Cromwell. His older brother, John Foster Dulles, was the Secretary of State during the Eisenhower Administration. Dulles was born on April 7, 1893, in Watertown, New York, one of five children of Presbyterian minister Allen Macy Dulles, and his wife, Edith F. (Foster). He was five years younger than his brother John Foster Dulles, Dwight D. Eisenhower's Secretary of State and chairman and senior partner of Sullivan & Cromwell, and two years older than his sister, diplomat Eleanor Lansing Dulles. His maternal grandfather was John W. Foster, who was Secretary of State under Benjamin Harrison, while his uncle by marriage, Robert Lansing served as Secretary of State under Woodrow Wilson. Dulles was uncle to Avery Dulles, a Jesuit priest, theologian, and cardinal of the Catholic Church, who taught at Fordham University from 1988 to 2008. Dulles graduated from Princeton University, where he participated in the American Whig-Cliosophic Society, and entered the diplomatic service in 1916. In 1920, he married Clover Todd (March 5, 1894 - April 15, 1974). They had three children; two daughters: Clover D. Jebsen, ("Toddy"), and Joan Buresch Dulles Molden, ("Joan Buresch"); and one son, Allen Macy Dulles, Jr., who was wounded and permanently disabled in the Korean War and has spent the rest of his life in and out of medical care. According to his sister, Eleanor, Dulles had "at least a hundred" extramarital affairs, including some during his tenure with the CIA. Dulles held anti-semitic views, but in 1921, while at the US Embassy in Istanbul, he had some involvement in exposing the infamous Protocols of the Elders of Zion as a forgery. Dulles unsuccessfully attempted to persuade the US State Department to publicly denounce the forgery. Initially assigned to Vienna, he was transferred to Bern, Switzerland along with the rest of the embassy personnel shortly before the U.S. entered the First World War. Later in life Dulles claimed to have been telephoned by the then obscure Vladimir Lenin, seeking a meeting with the American embassy on April 8, 1917. After recovering from the 1918 flu pandemic he was assigned to the American delegation at the Paris Peace Conference, along with his older brother Foster. From 1922-6, he served five years as chief of the Near East division of the Department of State. In 1926, he earned a law degree from George Washington University Law School and took a job at Sullivan and Cromwell, the New York firm where his brother, John Foster Dulles, was a partner. He became a director of the Council on Foreign Relations in 1927, the first new director since the Council's founding in 1921. He was the Council's secretary from 1933 to 1944. During the late 1920s and early 1930s, he served as legal adviser to the delegations on arms limitation at the League of Nations. There he had the opportunity to meet with Adolf Hitler, Benito Mussolini, Maxim Litvinov, and the leaders of Britain and France. In 1935 Dulles returned from a business trip to Germany appalled by the Nazi treatment of German Jews and, despite his brother's objections, led a movement within the law firm of Sullivan and Cromwell to close their Berlin office. As a result of Dulles' efforts, the Berlin office was closed and the firm ceased to conduct business in Nazi Germany. As the Republican Party began to divide into isolationist and interventionist factions, Dulles became an outspoken interventionist, running unsuccessfully in 1938 for the Republican nomination in New York's Sixteenth Congressional District on a platform calling for the strengthening of U.S. defenses. Dulles collaborated with Hamilton Fish Armstrong, the editor of Foreign Affairs magazine, on two books, Can We Be Neutral? (1936), and Can America Stay Neutral? (1939). They concluded that diplomatic, military, and economic isolation, in a traditional sense, were no longer possible in an increasingly interdependent international system. Dulles helped a number of German Jews, such as the banker Paul Kemper, escape to the United States from Nazi Germany. After the outbreak of the Second World War, Dulles was recruited to work at the Office of Strategic Services and moved to Bern, Switzerland, where he lived at Herrengasse 23 for the duration of World War II. As Swiss Director of the OSS, Dulles worked on intelligence regarding German plans and activities, and established wide contacts with German émigrés, resistance figures, and anti-Nazi intelligence officers. He was assisted in intelligence-gathering activities by Gero von Schulze-Gaevernitz, a German emigrant. Dulles also received valuable information from Fritz Kolbe, a German diplomat. Kolbe supplied secret documents regarding active German spies and plans regarding the Messerschmitt Me 262 jet fighter. Dulles was involved in Operation Sunrise, secret negotiations in March 1945 to arrange a local surrender of German forces in northern Italy. After the war in Europe, Dulles served for six months as the Office of Strategic Services Berlin station chief and later as station chief in Bern. The Office of Strategic Services was dissolved in October 1945 and its functions transferred to the State and War Departments. In the 1948 Presidential election, Dulles was, together with his brother, an advisor to Republican nominee Thomas E. Dewey. The Dulles brothers and James Forrestal helped form the Office of Policy Coordination. During 1949 he co-authored the Dulles–Jackson–Correa Report, which was sharply critical of the Central Intelligence Agency, which had been established by the National Security Act of 1947. Partly as a result of the report, Truman named a new Director of Central Intelligence, Lieutenant General Bedell Smith. In 1950, Smith recruited Dulles to oversee the agency's covert operations as Deputy Director for Plans. The same year Dulles was promoted to Deputy Director of Central Intelligence, second in the intelligence hierarchy. After the election of Dwight Eisenhower in 1952, Bedell Smith shifted to the Department of State and Dulles became the first civilian Director of Central Intelligence. The Agency's covert operations were an important part of the Eisenhower administration's new Cold War national security policy known as the "New Look". Under Dulles' direction, the CIA created MK-Ultra, a top secret mind control research project managed by Sidney Gottlieb. Dulles also personally oversaw Operation Mockingbird, a program that influenced foreign and domestic media companies. In the early 1950s, the United States Air Force conducted a competition for a new photo reconnaissance aircraft. Lockheed Aircraft Corporation's Skunk Works submitted a design number called the CL-282, which married sailplane-like wings to the body of a supersonic interceptor. This aircraft was rejected by the Air Force, but several of the civilians on the review board took notice, and Edwin Land presented a proposal for the aircraft to Dulles. The aircraft became what is known as the U-2 'spy plane', and it was initially operated by CIA pilots. Its introduction into operational service in 1957 greatly enhanced the CIA's ability to monitor Soviet activity through overhead photo surveillance. The aircraft eventually entered service with the Air Force. The Soviet Union captured a U-2 in 1960 during Dulles' term as CIA chief. In 1953, Dulles was involved, along with Frank Wisner, in Operation Ajax, the covert operation that led to the removal of democratically elected prime minister of Iran Mohammad Mossadeq, and his replacement with Mohammad Reza Pahlavi, Shah of Iran. Rumors of a Soviet takeover of the country had surfaced due to the nationalization of the Anglo-Iranian Oil Company. British diplomat Christopher Woodhouse had proposed the idea of a coup d'état to President Eisenhower to try to regain British control of the oil company. Several failed assassination plots utilizing CIA-recruited operatives from the Mafia and anti-Castro Cubans directly against Castro undermined the CIA's credibility. The reputation of the agency and its director declined drastically after the Bay of Pigs Invasion fiasco. President Kennedy reportedly said he wanted to "splinter the CIA into a thousand pieces and scatter it into the winds." However, following a "rigorous inquiry into the agency's affairs, methods, and problems ... [Kennedy] did not 'splinter' it after all and did not recommend Congressional supervision." During the Kennedy Administration, Dulles faced increasing criticism. In autumn 1961, following the Bay of Pigs incident and Algiers putsch against Charles de Gaulle, Dulles and his entourage, including Deputy Director for Plans Richard M. Bissell, Jr. and Deputy Director Charles Cabell, were forced to resign. 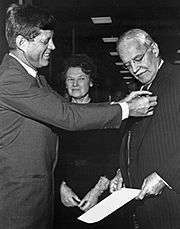 On November 28, 1961, Kennedy presented Dulles with the National Security Medal at the CIA Headquarters in Langley, Virginia. The next day, November 29, the White House released a resignation letter signed by Dulles. JFK (1991), a fictional film that depicts Jim Garrison, a New Orleans District Attorney, as suspecting Dulles as a participant in the cover-up surrounding Kennedy's assassination and attempts to subpoena him. The FX cartoon comedy Archer mentions Dulles in a 2012 episode while discussing Operation Gladio. 1 2 "Allen W. Dulles, C.I.A. Director From 1953 to 1961, Dies at 75. 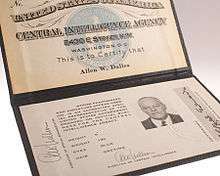 Allen W. Dulles, Director of Central Intelligence From 1953 to 1961, Is Dead at 75". New York Times. January 31, 1969. ↑ "Allen Welsh Dulles – CIA director". CNN. Archived from the original on 2008-01-07. Retrieved 2011-09-16. ↑ "Twelve Freshman Debates Chosen From Whig Hall". The Daily Princetonian. 36 (29). 31 March 1911. p. 2. Retrieved 15 May 2012. ↑ Grose 1994, pp. 457. ↑ "When a C.I.A. Director Had Scores of Affairs". The New York Times. 2012-11-10. Retrieved 5 November 2014. .
1 2 Grose 1994, pp. 26. ↑ Grose 1994, pp. 36, 46. ↑ "History of CFR: Appendix: Historical Roster of Directors and Officers". Council on Foreign Relations. Retrieved 2011-09-16. ↑ Grose 1994, pp. 100, 112. 1 2 Srodes 1999, pp. 189–190. 1 2 Grose 1994, p. 121. ↑ Grose 1994, pp. 214. ↑ Powers, Francis (2004). Operation Overflight: A Memoir of the U-2 Incident. Potomac Books, Inc. p. 324. ISBN 9781574884227. ↑ Immerman 1982, pp. 133-160. 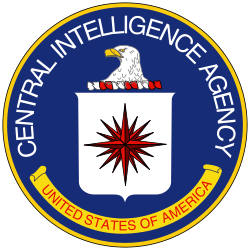 ↑ "CIA: Maker of Policy, or Tool?". The New York Times. April 25, 1966. p. 20, column 3. Retrieved 2011-09-16. ↑ John F. Kennedy. Remarks Upon Presenting an Award to Allen W. Dulles, November 28, 1961 (Gerhard Peters and John T. Woolley, The American Presidency Project). ↑ "Dulles, Allen W., June 1959-November 1962". Jfklibrary.org. Retrieved 5 November 2014. ↑ "The Dulles brothers and their secret wars". Radio National. Retrieved 5 November 2014. ↑ Lim, Xiuhui (1 November 2002). "Letter from Xiuhui Lim to Kofi Annan" (PDF). United Nations. Archived from the original (PDF) on December 26, 2012. Retrieved 15 May 2012. ↑ "Dignitaries Attend Funeral For Dulles". New York Times. February 2, 1969. ↑ "Arcade Publishing". Arcadepub.com. 2012-09-01. Retrieved 2014-06-22. ↑ Todd VanDerWerff (2012-02-16). "AV Club". AV Club. Retrieved 2014-06-22.